Over 99 film screenings & music concerts pack the schedule at this annual citywide celebration from April 20-23, 2017. 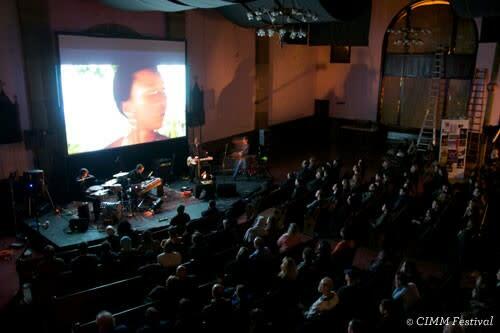 The Chicago International Movies & Music Festival brings four days of over 99 exceptional films and exciting concerts to Chicago&apos;s eclectic Chicago neighborhoods from April 20-23, 2017. CIMMfest originated from a love of music and film. Musician Josh Chicoine and filmmaker Ilko Davidov imagined the fest and made it a reality nine years ago. Today, the fest is a popular celebration with thousands attending each year. The international films include documentaries, fiction, concert films, shorts, and music videos from all countries and cultures. The music portion of this event recently expanded with more than fifty bands and twenty venues participating since 2013. Learn more about the seventh annual CIMMfest at cimmfest.org. Choose between access to 200+ events for the full four-day experience or a jam-packed day of various concerts and screenings. Buy tickets at cimmfest.org. 4-Day Festival Passes: Get access to all four days of 200+ CIMMfest events, plus reserved seating at one headliner event for $79. 4-day Festival + Conference Passes: Get access to all four days of 200+ CIMMfest events, plus reserved seating at one headliner event for $99. In addition, attendees with this pass can enjoy the film and music conference, panels, workshops and much more. VIP Passes: Get access to all four days of 200+ CIMMfest events, plus reserved seating at four headliner events for $149. In addition, experience ALL there is to offer at this year&apos;s CIMM festival including the film and music conference, panels, workshops, networking events, VIP Schwag Bag and much more. Tickets for individual screenings and shows are also available for purchase-prices starting at $12. Buy tickets by clicking on individual shows listed in the 2017 movies and music lineups. Get the full CIMMfest schedule and find information on parking, room bookings, and all the recent CIMMfest news at cimmfest.org.